Christiane Grünloh, one of the members of our research group, will soon be defending her PhD thesis. Last week, it was time for her to present a draft of her work, which she plans to defend by the end of the year. I jump on the opportunity to write of few lines on her research, which revolves around the Patient-Accessible Electronic Health Record online. Christiane is one of the researchers of the DOME Consortium, working on the Development of Online Medical records and E-health services. 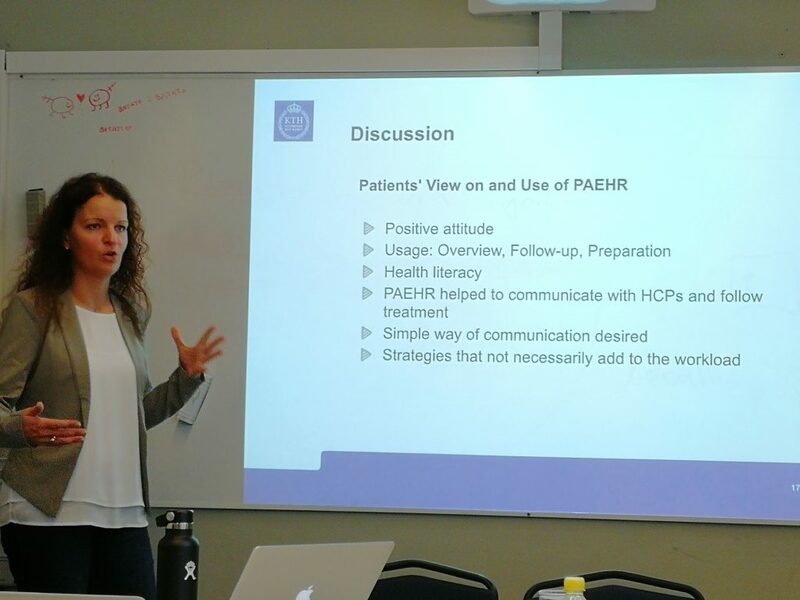 She has been focusing on investigating the perspective of, respectively, physicians and patients on the EHR online – “Journalen” in Swedish. Research about this topic is particularly important since the implementation of Journalen in Sweden has been a very controversial project. Indeed, while patient organizations predominantly were in its favour, caring professionals were, for the most part, against it. 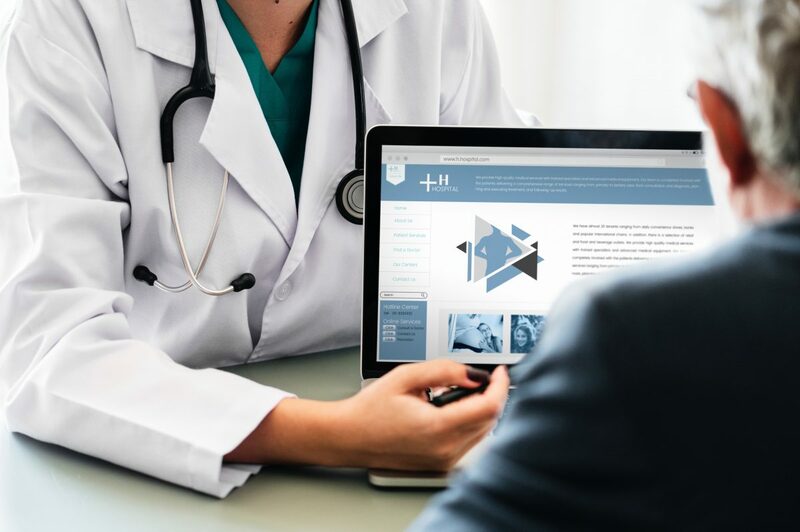 In her research, Christiane was able to look more closely at the reasons behind physicians’ strong opposition to the idea of enabling patients to access their EHR online. She was also able to investigate what was the value of this service from the patients’ point of view. In doing so, she found that physicians and patients had very different perspectives on the topic, and reflected on ways to bridge the gap between those two groups in order to improve the quality of the patient-physician relationship. You can find Christiane on Twitter (where she is a very active user!) and LinkedIn. 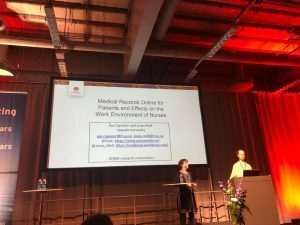 If you were attending the Vitalis / MIE 2018 conference in Gothenburg, you maybe also were able to attend her workshop on “Identifying the Need of Self-reported Data and Self-measurements for Diagnosis and Treatment of Cancer”, which she is held together with Jonas Moll, Isabella Scandurra and Åsa Cajander last Thursday. Sofie Wass successfully defended her PhD thesis last week at Jönköping University, and I was the opponent at the defense. The thesis is about eHealth Innovations and consist on work related to two eHealth innovations: medical records online for patients & the service “My referrals”. Two papers are on medical records online for patients in her thesis. Sofie Wass included five publications in her thesis and she has used an unusual variety of methods in her papers. You find 1) one literature study on open innovation and eHealth, 2) one interview study with experts and decision makers in health care, 3) one study on using business models for eHealth including interviews, a workshop and observations, and finally also 4) one study using interviews and 5) a survey to health care professionals and one to patients. The thesis is well worth reading for those who are in the eHealth and innovations area. The introduction text includes an overview of eHealth in Sweden with some of the major milestones described around the progress of eHealth. Here one can read that the official work with strategic work in eHealth started as late as 2002, and that the coordination of eHealth in Sweden has been coordinated by different organizations throughout the years. There are few studies on eHealth and Open innovation: Only 18 papers were found in her literature study. Professionals working in outpatient clinics were less positive towards medical records online for patients than those in primary care. 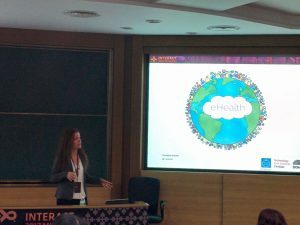 As I wrote in the previous post, I recently had the opportunity to attend and present at INTERACT which took place in Mumbai, India. In this post, I write about two posters & demos. The Poster and demos sessions took place in every coffee / tea break during the whole conference, giving the attendees plenty of opportunitities to visit the individiual demo booths. 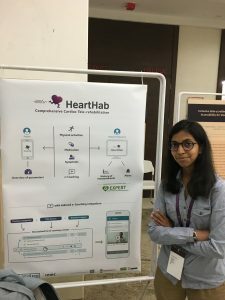 developed the tool after conducting a workshop and multiple brainstorms with various caregivers involved in coaching cardiac patients to connect their perspectives with patient needs. It was integrated into a comprehensive tele-rehabilitation application. Supraja was one of the participants in our EIT Health / ACM SIGCHI eHealth summer school (see here, or here), so it was really nice meeting her again at the conference. Supraja was born in India, and she went out of her way helping us Non-Indians, for instance explaining the food or local practices to me. It was really fun! 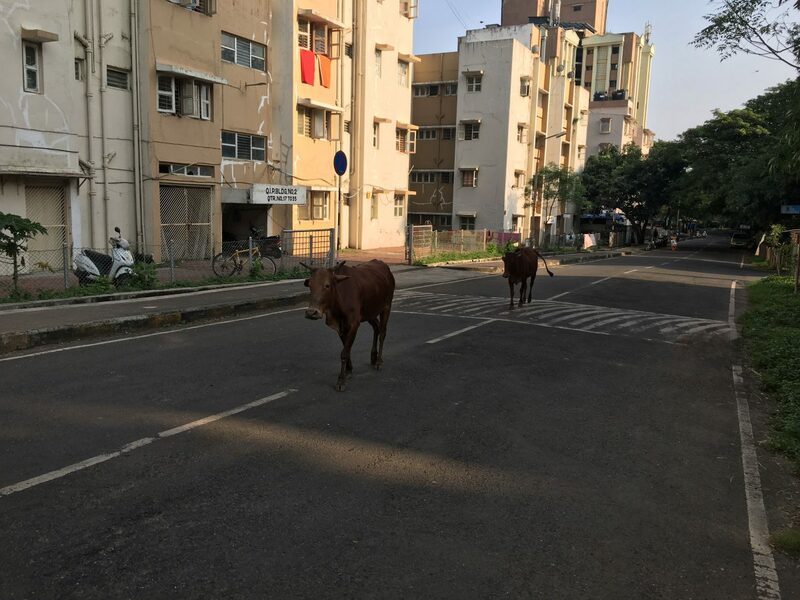 Mind the Gap is a provocative, playful intervention and a research tool that illuminates players’ attitudes and experiences concerning gender privilege and discrimination in ICT. It initiates a structured social interaction around gender issues driven by role-play and participant authored texts. The gameboard charts a typical technology carreer path. Female Player Characters (PC’s) roll a 4-sided die, male PC’s roll a 6-sided die. 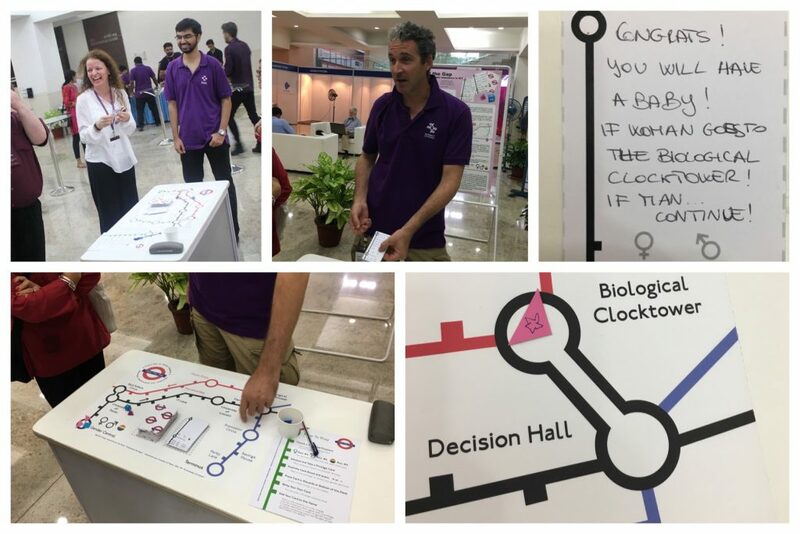 Players advance and draw a ‘privilege’ card describing a scenario which is scored to reflect a penalty or an advanage according to the gender of the PC. During the game, players an author their own privilege cards, add decisions, or create new rules and add them to the game. Playing this game was really fascinating, but also reading the cards authored by previous players. It didn’t take long for me to pick the card which you see in the picture below: “Congrats! You will have a baby!” As my character was female like me (the character is drawn at the beginning of the game), I had to leave the career path and go on the family path. Later I drew the card “Change gender to female, if you are men”. Too bad – I might have wanted my character to change to male in that case 🙂 The game drew a lot of attention and it was really interesting. I am really looking forward to reading more about their findings in the future. For more information, visit their project website. 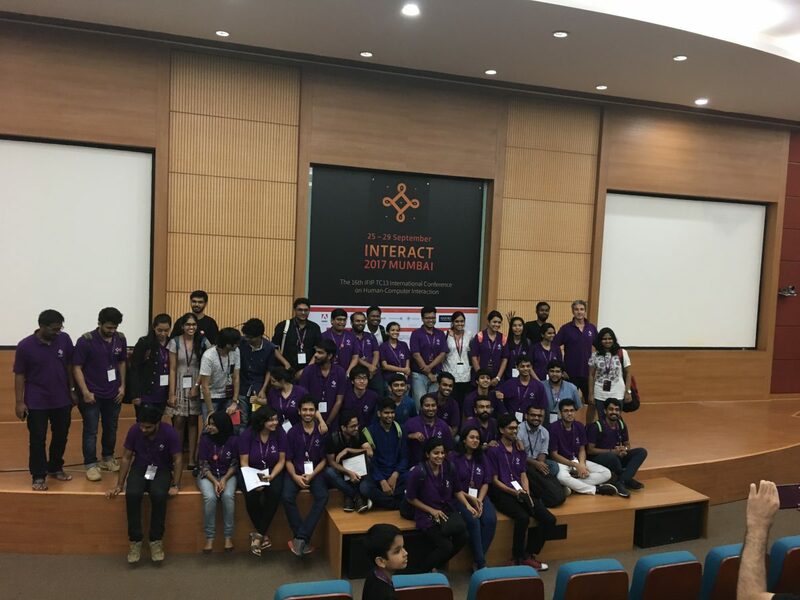 This year’s INTERACT conference took place in Mumbai, India. It started off with field trips and workshops on Monday and Tuesday. The main conference was held from 27-29. September. The conference was extremely well organised and I am very glad that I could attend, listen to interesting talks, present our own paper, and meet so many kind and open people who do extremely interesting research. INTERACT is a biennial conference and is organised by the Technical Committee on Human–Computer Interaction (IFIP TC13) of the International Federation for Information Processing (IFIP). IFIP is a non-governmental umbrella organisation of national societies working in the field of Information technology. IFIP is organised through technical commitees; TC13 is the committee on Human-Computer Interaction and consists of serveral working groups. This year’s INTERACT conference was the 16th conference; the previous one took place 2015 in Bamberg (Germany). INTERACT in Bamberg was my first international conference, where I presented a paper on the use of online reviews in the design process and how they can help designers to take the perspective of the people they are designing for. This year was the first time, that researchers could propose field trips. As the deadline for registrating one’s interest was before I was notified that our short paper was accepted, I thought that participation was not possible any more. However, Arne Berger, the organiser of one field trip saw on Twitter, that I was attending the conference and asked whether I was interested in joining one day, as there was still a free spot. Excellent opportunity indeed! The field trip Understanding The Informal Support Networks Of Older Adults in India aimed to get a nuanced view on older adults’ practices of receiving from and providing support to peers, family, friends, and neighbors. It was a two-day fieldtrip, however, I only attended on Monday. Here we were split into two groups and I was forming a group together with Dhaval Vyas (Queensland University of Technology) and Antonella De Angeli (University of Trento). We conducted two interviews during the day. The couple we interviewed first felt more comfortable speaking in Hindi, so Dhaval interviewed them, and every now and then translated his question and/or their answers in English. That was a really interesting experience and Dhaval did a great job also including us, when he translated every now and then, what was said. Of course, this was not always possible, as this would have disturbed the flow of the conversation. Something I noticed was that the idea of “older people receiving support” was challenged: This couple was not receiving support from their family in that sense. Instead, they were providing tremendous support for their children, because they took care of the grandkids. The second interview took place in the afternoon, where we met a 85 year old woman, who had worked as a teacher until she was 80 years old. She felt comfortable speaking English, so all of us could ask her questions. I found her to be very inspiring and positive; it was a great pleasure talking to her and learning how she goes about her day. For example, she likes playing chess on the iPad and, according to her son, her memory improved since she does this. 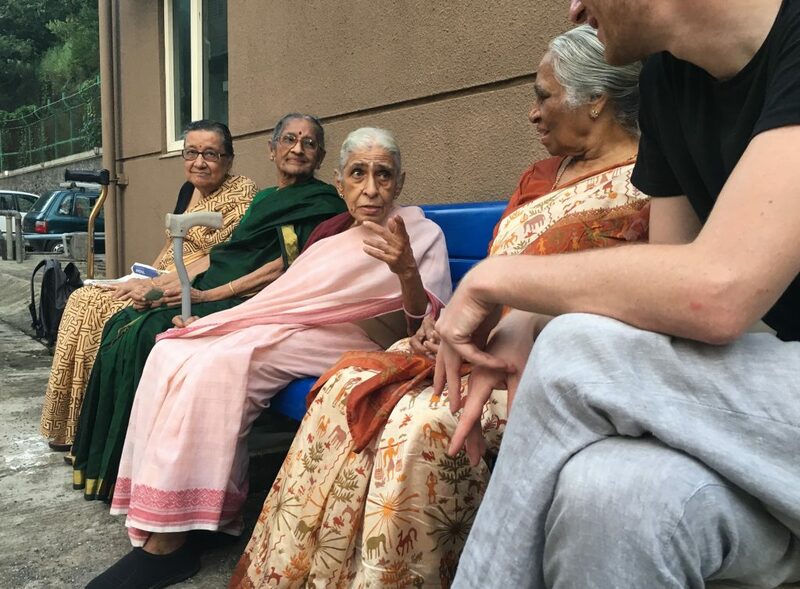 Every evening, she meets a couple of her female friends outside the house, where they all sit on the bench, enjoy each other’s company, and watch the grandkids play. We were invited to join her when she was meeting her friends right after the interview, which was really nice, too. I also was able to present our short paper on “Using Critical Incidents in Workshops to Inform eHealth Design”. This paper is based on the workshop we organised at NordiCHI 2016 and was written together with some of the organisers and participants. Practitioners, researchers and patients were invited to contribute with a critical incident related to eHealth services for patients and relatives. We accepted five critical incidents, of which three focussed on the patient perspective and two on the developer’s perspective. You can find the critical incidents submitted and analysed in the workshop here. In the paper, we reflect on Critical Incidents as a format, which we made use of in our workshop. In sum, the participants and we as organisers found it very helpful to reflect together in a group on eHealth projects. Even though the format was quite unusual and some participants reported, that they struggled to follow our instructions related to the critical incidents, it also helped to re-examine and re-frame their particular project. I really enjoyed presenting this at INTERACT on behalf of my co-authors. I have to admit, that the time constraint of 8 minutes was quite tough. But our session chair Jacki O’Neill did a wonderful job creating a positive atmosphere while keeping the time. In part 2, I will write about the poster & demo session. Patient Accessible Electronic Health Records: Germany on its way to join the club? Doing research in DOME and DISA is very exciting for me; especially seeing the Patient Accessible Electronic Health Records (PAEHR) in practice. Every time one of my colleagues logs into the portal and shows a feature in the Swedish Portal Journalen I think: “I want this, too!” I have a background in Media Informatics and worked as a medical assistant, where I myself wrote many medical notes into the EHR. Thus, I do not consider it to be rocket science to graphically visualize lab results or show an overview of patient’s visits to the doctor. However, as I am living in Germany, it feels a bit like coming from the Stone Age seeing Journalen in action, because we are currently so far behind in relation to eHealth. For instance, our prescriptions are still on paper; as are referrals and sick notes. End of 2003 it was determined by the German government to modernize statutory health insurance, including the implementation of an electronic health insurance card. This caused lots of critique and opposition, not only from physicians but also from citizens. The development and rollout is ongoing for more than ten years now; and the cost are already amount to 1.7 billion Euro. In the future, the card may contain some medical information in case of an emergency (like allergies, allergies, implants, chronic diseases or medication). However, claims that putting medical information on a physical card would lead to “Better quality of medical care thanks to better information on medical data” are in my opinion questionable and the very idea of the need for a physical card not very future-oriented! I really want to have access to my (whole!) EHR, but at the same time I do not want to carry it around with me in my wallet. Besides: very recent information such as lab results would not be on the card anyway. Today, the card carries the same basic information about the insured person as before (name, date of birth, address, personal health insurance number and insurance status) and additionally a photograph. Until now, the promised additional services have not been implemented. Physicians cannot even update your address yet in case you moved house, which has been one of the selling points. So in sum: Germany is way behind and it seems to me that we put millions of Euros into a technology that is probably already outdated when it’s finally implemented. I recently watched a talk in the re:health track of the re:publica 2017, which is a European conference about digital culture in the world. The talk was called “Play it safe – the electronic health record and data security” (my translation; available on Youtube in German, but with English subtitles). The title made me curious and I was surprised to learn that a statutory health insurance company (Techniker Krankenkasse) aims to develop and implement a PAEHR in collaboration with IBM. Immediately concerns popped into my head: what about privacy and data protection? For sure, the insurance company would like to collect more data about their insured people and consequently will change the premiums accordingly (which is already happening with car insurance). This would however go against the very idea of the „Solidargemeinschaft“ (collective body of the insured) which is the case in Germany, i.e. people insured with a statutory health insurance all pay the same premium, regardless of having a pre-existing condition, engaging in high-risk sports, or whether they don’t exercise at all. Private insurers already calculate premiums based on certain risk factors. Therefore, I was surprised and relieved to hear from the CEO of the insurance company, Jens Baas, that behaviour-based insurance is neither the motivation nor is planned in the future. Furthermore, he mentioned that he is currently in discussion with the Federal Minister of Health, Hermann Gröhe, that this should be expressly stipulated in the law to prevent this also for the future. In collaboration with IBM, the insurance company wants to take a lead to prevent foreign companies to take over, as it is clear that citizens want to have access to their EHR. In addition: people already collect many data that are currently stored overseas on servers from Apple, Garmin, etc. According to Jens Baas, they would like to provide a “safe heaven” for these types of data as well. The insured person owns her data, not the insurance company! Thus, people themselves decide, who will have access. As the CEO points out, not even the insurance company will have access. Neither would anonymized data be given to other interest group (such as research), as they often can be de-anonymized. Being a statutory health insurance, the Techniker Krankenkasse does not aim to provide different insurance options. In his talk Jens Baas emphasized that people should have the “right to irrationality” (Recht auf Unvernunft), i.e. you do not have to pay higher premiums when you do not live up to certain rules (e.g. fail to walk 10.000 steps a day, smoke or engage in sport activities that may cause injuries). Data will be stored centrally and secure – the insurance card will not be necessary for this. Maybe as an access point, but the EHR will not be stored on the card. The central data storage is of concern for many, as it could offer a central entry point for hacker. As Jens Baas pointed out: there is no such thing a 100 % data protection. This is by the way also the case with paper-based records, as was seen recently in Melbourne. However, to address the security aspect, they aimed to work together with a competent partner to make it as secure as possible, while at the same time make sure that the data is still usable. Data is to be stored in Germany and thus German data privacy acts are to be applied. Although this development starts as an initiation from Techniker Krankenkasse, the idea is to make this also available for other insurance companies. This means, that we hopefully won’t have a separate patient portal for each insurance company. Who gains? If the insurance company will not have access to the data, why do they invest in this? According to the CEO, they want to be able to offer additional and individualized services that attract more customers. I think, this is very exciting! Whenever we are talking about patient portals in DOME or DISA, I was rather pessimistic that Germany will have anything close to that within the next 10-15 years. The concerns especially with regard to a central data storage is valid, but that should not prevent the development of web-based access for patients to their data in general. As Baas pointed out, we have to balance risks and opportunities; saying you don’t want to take any risks means in the end the opportunities are next to zero. 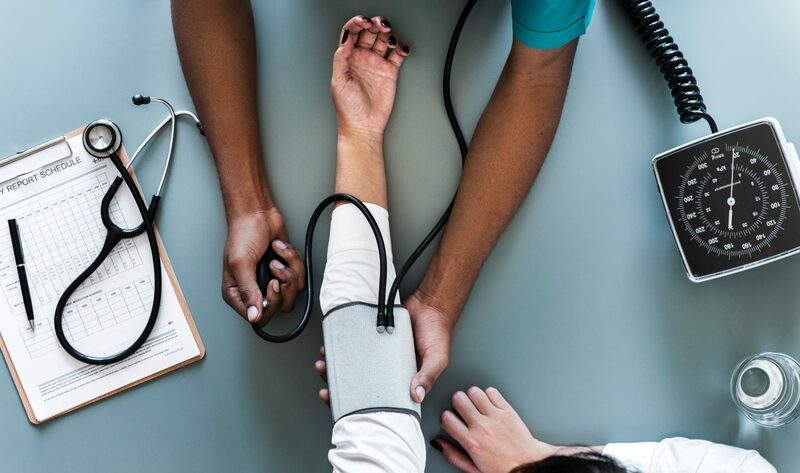 On the recent German congress of physicians, Sascha Lobo (Blogger and so-called internet expert) called on the physicians, to actively co-create the process of digitalization. Hopefully, the project by Techniker Krankenkasse and IBM is more successful to present healthcare professionals the benefits PAEHR can have – not only for the patients but also for healthcare professionals – as experiences in other countries (e.g. OpenNotes in US, Journalen in Sweden) have shown. Author Christiane GrünlohPosted on May 29, 2017 October 5, 2017 Categories DISA, DOME, eHealth1 Comment on Patient Accessible Electronic Health Records: Germany on its way to join the club?